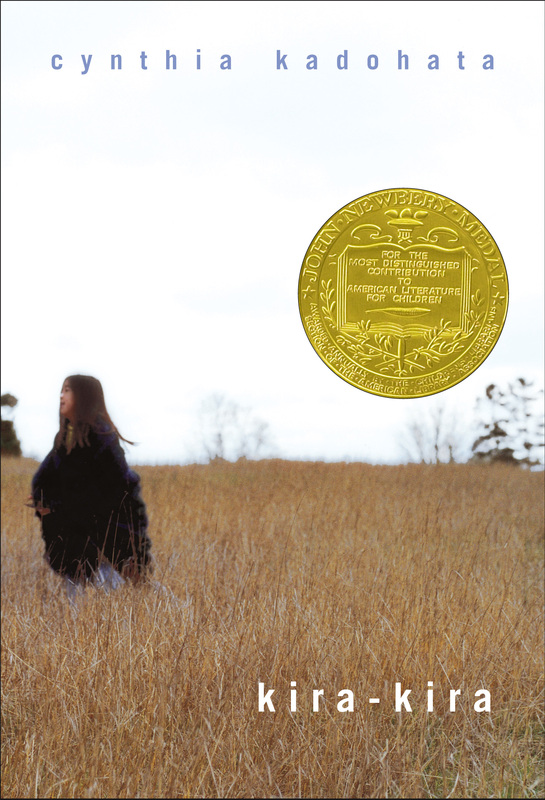 A Japanese-American family struggles to build a new life in the Deep South of Georgia in this luminous novel, winner of the Newbery Medal. Glittering. That's how Katie Takeshima's sister, Lynn, makes everything seem. The sky is kira-kira because its color is deep but see-through at the same time. The sea is kira-kira for the same reason. And so are people's eyes. When Katie and her family move from a Japanese community in Iowa to the Deep South of Georgia, it's Lynn who explains to her why people stop them on the street to stare. And it's Lynn who, with her special way of viewing the world, teaches Katie to look beyond tomorrow. But when Lynn becomes desperately ill, and the whole family begins to fall apart, it is up to Katie to find a way to remind them all that there is always something glittering -- kira-kira -- in the future. Luminous in its persistence of love and hope, Kira-Kira is Cynthia Kadohata's stunning debut in middle-grade fiction. My sister, Lynn, taught me my first word: kira-kira. I pronounced it ka-a-ahhh, but she knew what I meant. Kira-kira means "glittering" in Japanese. Lynn told me that when I was a baby, she used to take me onto our empty road at night, where we would lie on our backs and look at the stars while she said over and over, "Katie, say 'kira-kira, kira-kira.'" I loved that word! When I grew older, I used kira-kira to describe everything I liked: the beautiful blue sky; puppies; kittens; butterflies; colored Kleenex. My mother said we were misusing the word; you could not call a Kleenex kira-kira. She was dismayed over how un-Japanese we were and vowed to send us to Japan one day. I didn't care where she sent me, so long as Lynn came along. I was born in Iowa in 1951. I know a lot about when I was a little girl, because my sister used to keep a diary. Today I keep her diary in a drawer next to my bed. I like to see how her memories were the same as mine, but also different. For instance, one of my earliest memories is the day Lynn saved my life. I was almost five, and she was almost nine. We were playing on the empty road near our house. Fields of tall corn stretched into the distance wherever you looked. A dirty gray dog ran out of the field near us, and then he ran back in. Lynn loved animals. Her long black hair disappeared into the corn as she chased the dog. The summer sky was clear and blue. I felt a brief fear as Lynn disappeared into the cornstalks. When she wasn't in school, she stayed with me constantly. Both our parents worked. Officially, I stayed all day with a lady from down the road, but unofficially, Lynn was the one who took care of me. After Lynn ran into the field, I couldn't see anything but corn. "Lynnie!" I shouted. We weren't that far from our house, but I felt scared. I burst into tears. Somehow or other, Lynn got behind me and said, "Boo!" and I cried some more. She just laughed and hugged me and said, "You're the best little sister in the world!" I liked it when she said that, so I stopped crying. The dog ran off. We lay on our backs in the middle of the road and stared at the blue sky. Some days nobody at all drove down our little road. We could have lain on our backs all day and never got hit. Lynn said, "The blue of the sky is one of the most special colors in the world, because the color is deep but see-through both at the same time. What did I just say?" "The ocean is like that too, and people's eyes." She turned her head toward me and waited. I said, "The ocean and people's eyes are special too." That's how I learned about eyes, sky, and ocean: the three special, deep, colored, see-through things. I turned to Lynnie. Her eyes were deep and black, like mine. The dog burst from the field suddenly, growling and snarling. Its teeth were long and yellow. We screamed and jumped up. The dog grabbed at my pants. As I pulled away, the dog ripped my pants and his cold teeth touched my skin. "Aaahhhhh!" I screamed. Lynn pulled at the dog's tail and shouted at me, "Run, Katie, run!" I ran, hearing the dog growling and Lynnie grunting. When I got to the house, I turned around and saw the dog tearing at Lynn's pants as she huddled over into a ball. I ran inside and looked for a weapon. I couldn't think straight. I got a milk bottle out of the fridge and ran toward Lynn and threw the bottle at the dog. The bottle missed the dog and broke on the street. The dog rushed to lap up the milk. Lynn and I ran toward the house, but she stopped on the porch. I pulled at her. "Come on!" She looked worried. "He's going to cut his tongue on the glass." But she got the water hose and chased the dog away with the water, so it wouldn't hurt its tongue. That's the way Lynn was. Even if you tried to kill her and bite off her leg, she still forgave you. The corn was so pretty. When it was all around me, I felt like I wanted to stay there forever. Then I heard Katie crying, and I ran out as fast as I could. I was so scared. I thought something had happened to her! Later, when the dog attacked me, Katie saved my life. I didn't really see things that way. If she hadn't saved my life first, I wouldn't have been able to save her life. So, really, she's the one who saved a life. Lynn was the bravest girl in the world. She was also a genius. I knew this because one day I asked her, "Are you a genius?" And she said, "Yes." I believed her because the day my father taught her how to play chess, she won her first game. She said she would teach me how to play if I wanted. She always said she would teach me everything in the world I needed to know. She said we would be rich someday and buy our parents seven houses. But first they would buy a house for all of us. That wonderful day was not far off. I found this out one afternoon when Lynn pulled me into the kitchen, her eyes shining. "I have to show you something," she said. She reached under the refrigerator and pulled out a tray. A worn envelope sat inside. She opened the envelope up and showed me what was inside: cash. "Is that real?" I said. "Uh-huh. It belongs to Mom and Dad. It's for our house we're going to buy." We lived in a little rented house in Iowa. I liked our little rented house, but Lynn always told me I would love our very own house. Then we could get a dog, a cat, and a parakeet. Lynn looked at me expectantly. I said, "Doesn't money belong in a bank?" "They don't trust the bank. Do you want to count it?" She handed me the envelope, and I took the money in my hands. It felt damp and cool. "One, two, three..." I counted to eleven. Eleven hundred-dollar bills. I wasn't sure what to think. I found a dollar once in a parking lot. I bought a lot of stuff with that. With eleven hundred dollars, it seemed you could buy anything. "I hope our house is painted sky blue," I said. "It will be." She put the money back. "They think it's hidden, but I saw Mom take it out." Our parents owned a small Oriental foods grocery store. Unfortunately, there were hardly any Oriental people in Iowa, and the store went out of business shortly after Lynn and I first counted the money under the refrigerator. My father's brother, my uncle Katsuhisa, worked in a poultry hatchery in Georgia. He said he could get my father a job at the hatchery. And, he said, he could get my mother a job working in a poultry processing factory. A few weeks after the store went out of business, my father decided to take us down to Georgia to join the poultry industry. So we owed Uncle Katsuhisa a big favor for helping us. Katsu means "triumph" in Japanese. For some reason I always thought "triumph" and "trumpet" were the same thing, and I thought of my uncle as a trumpet. Lynn said Uncle Katsuhisa was an odd fish. He was as loud as my father was quiet. Even when he wasn't talking, he made a lot of noise, clearing his throat and sniffing and tapping his fingers. Sometimes, for no reason that I could see, he would suddenly stand up and clap his hands together really loudly. After he got everyone's attention, he would just sit down again. He even made noise when he was thinking. When he was deep in thought, he had a way of turning his ears inside out so they looked kind of deformed. The ears would make a popping sound when they came undone. Lynn said you could hear him thinking: Pop! Pop! A buttonlike scar marked one side of Uncle Katsuhisa's nose. The story was that when he was a boy in Japan, he was attacked by giant crows, one of which tried to steal his nose. He, my father, and my mother were Kibei, which meant they were born in the United States but were sent to Japan for their education. The crows of Japan are famous for being mean. Anyway, that was the story Lynn told me. It was a sweltering day when Uncle Katsuhisa arrived in Iowa to help us move to Georgia. We all ran outside when we heard his truck on our lonely road. His truck jerked and sputtered and was generally as noisy as he was. My mother said, "Will that truck make it all the way to Georgia?" My father hit his chest with his fist. That's what he did whenever he wanted to say, Definitely! He added, "He's my brother." Our father was solid and tall, six feet, and our mother was delicate and tiny, four feet ten. As tiny as she was, she scared us when she got mad. Her soft face turned hard and glasslike, as if it could break into pieces if something hit it. As my parents watched Uncle's truck my father reached both of his arms around my mother, enveloping her. He stood with her like that a lot, as if protecting her. "But his being your brother has nothing to do with whether the truck will make it all the way to Georgia," my mother said. My father said, "If my brother says it will make it, then it will make it." He didn't seem to have a doubt in the world. His brother was four years older than he was. Maybe he trusted Uncle Katsuhisa the way I trusted Lynn. Lynn whispered to me, "Frankly, I wonder whether the truck will make it all the way up the road to our house, let alone to Georgia." "Frankly" was her favorite word that week. Our mother looked at us suspiciously. She didn't like it when we whispered. She thought that meant we were gossiping, and she was against gossiping. She focused on me. She was trying to read my mind. Lynn said whenever our mother did that, I should try to think nonsense words in my head. I thought to myself, Elephant, cow, moo, koo, doo. Elephant...My mother turned back around, to watch the truck. When the truck finally rumbled up, Uncle Katsuhisa jumped out and immediately ran toward Lynn and me. I stepped back, but he swooped me up in his arms and shouted, "My little palomino pony! That's what you are!" He twirled me around until I felt dizzy. Then he set me down and picked up Lynn and twirled her around and said, "My little wolfie girl!" He set Lynn down and hugged my father hard. He hugged my mother delicately. While Uncle hugged my mother, she turned her face away a bit, as if his loudness made her feel faint. It was hard to see how my father and Uncle Katsuhisa could be related. My father was mild, like the sea on a windless day, with an unruffled surface and little variation. He was as hard as the wall in our bedroom. Just to prove how strong he was, he used to let us hit him in the stomach as hard as we could. Some days we would sneak up on him and punch him in the stomach, and he never even noticed. We would sneak away while he kept listening to the radio as if nothing had happened. My father liked to think. Sometimes Lynn and I would peek at him as he sat at the kitchen table, thinking. His hands would be folded on the table, and he would be frowning at nothing. Sometimes he would nod, but only slightly. I knew I would never be a thinker like my father, because I couldn't sit that still. Lynn said he thought so much that sometimes weeks or even months passed before he made a decision. Once he decided something, though, he never changed his mind. He'd thought many weeks before deciding to move us to Georgia. By the time he decided, there was only six hundred dollars in cash left in the envelope under the refrigerator. The night Uncle Katsuhisa arrived in Iowa, he left the dinner table early so he could go out and take a walk and maybe talk to himself. After the front door closed, my mother said that Uncle Katsuhisa was the opposite of my father in that he didn't look before he leapt, didn't think at all before he made decisions. She lowered her voice and said, "That's why he married that woman," meaning his first wife. Strictly speaking, Mom was gossiping, but who was going to tell her? We all sat silently. My father and uncle were different in other ways. Uncle Katsuhisa liked to talk to anyone, even to himself. My father didn't like to talk, except to my mother. He preferred to read the newspaper. My uncle, on the other hand, never read the paper. He did not give a hoot what President Eisenhower had to say. My uncle was exactly one inch taller than my father. But his stomach was soft. We knew this because we hit him in it once the year before, and he yelped in pain and threatened to spank us. We got sent to bed without supper because my parents said hitting someone was the worst thing you could do. Stealing was second, and lying was third. Before I was twelve, I would have committed all three of those crimes. 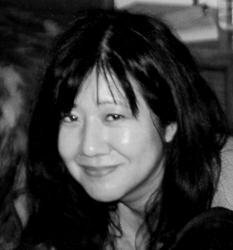 Cynthia Kadohata is the author of the Newbery Award winner and New York Times bestseller Kira-Kira, her debut novel for children. She has also published three novels for adults, including The Floating World, for which she was named a Whiting Fellow. Her short stories have been published in The New Yorker, Grand Street Magazine, and Ploughshares. A graduate of the University of Southern California, she has taken graduate courses in writing at the University of Pittsburgh and Columbia University. A great deal of Cynthia's writing inspiration comes from her travels across America: as a child her family lived in Georgia and Arkansas before settling in Chicago, and as an adult, she explored the states on a Greyhound bus. She currently lives with her son in California. Her next book for children, Weedflower, will be published by Atheneum in Spring 2006. • Mrs. Takeshima is troubled at how "un-Japanese" her daughters seem, and vows to one day send them back to Japan. Debate how difficult it was in the early 1950s to belong to one culture and live in another. Why is Mrs. Takeshima so fearful that her daughters will lose their sense of heritage? Discuss customs that the Takeshima family practices that demonstrates the family's loyalty to their native culture. • Katie describes her mother as "a delicate, rare and beautiful flower." Find examples in the novel that support Katie's description of her mother. • Discuss Katie and Lynn's relationship. Why does Katie feel that her parents like Lynn best? It is Lynn who tells Katie that they are moving to Georgia, and it is Lynn who tells her that their mother is pregnant. Why do Mr. and Mrs. Takeshima leave such important discussions up to Lynn? At what point do Lynn and Katie switch roles? • Describe the friendship that develops between Lynn and Amber. What does Katie mean when she says "Amber broke ranks and became Lynn's first best friend?" Why does Amber drop Lynn as a friend? Discuss why Katie is so hurt that Amber doesn't come to Lynn's funeral. Contrast Katie and Silly's friendship with Lynn and Amber's. • What is Uncle Katsuhisa's role in the family? Katsu means triumph in Japanese. How does Uncle Katsuhisa live up to his name? Katie finds it difficult to see that her father and uncle are brothers. Contrast their personalities. What does Mrs. Takeshima mean when she says that Uncle Katsuhisa "didn't look before he leapt"? • Hitting, stealing, and lying are the three worst crimes to Mr. and Mrs. Takeshima. How does Katie commit each of these crimes in the course of the novel? Discuss the scene where Katie steals pink nail polish for Lynn. How does she justify this crime to herself? Discuss why Katie's crime makes her mother feel that the family is falling apart. • Lynn wakes up crying one night and says that in her dream she is swimming in the ocean. How does this dream foreshadow her death? Discuss the symbolism of the brown moth in Lynn's bedroom on the night she dies. • Describe the sense of community among the Japanese families in Chesterfield, Georgia. Mr. Kanagawa is considered the leader of the community. How is his leadership revealed in the novel? How does Lynn become the leader of the children in the community? • Prejudice is an underlying theme in the novel. The first time that Katie experiences prejudice is at the motel in Tennessee when her family is moving to Georgia. Why does Mr. Takeshima quietly give in to the motel clerk and take the room in the back? How does Lynn help Katie understand the prejudices that she will experience at school? Discuss why the Japanese mothers cut and curl their daughters' hair when they begin school. Debate whether they really believe that changing the girls' appearance will make them fit in, and suffer less acts of prejudice. • Discuss the meaning of the word "exploit." How does Mr. Lyndon exploit the workers at the hatchery? Some of the workers are trying to unionize so that they can demand better working conditions. Mrs. Takeshima stays away from them because she feels that it is wrong to fight the people who are trying to help you. Why does she feel that Mr. Lyndon is trying to help them? Why do Mr. and Mrs. Takeshima decide to attend the pro-union meeting at the end of the novel? • Discuss how the trip to California helps Katie come to terms with Lynn's death. How does she help her parents deal with their grief? • What are the elements of hope in the novel? • Mrs. Takeshima feels that her girls must return to Japan to learn about their femininity. Research the role of women in Japan today. Write a brief article that might appear in a book called Women in Other Cultures. • Brenda Swamp, named for a ten-year-old girl who died there, is near Chesterfield and is the subject of a local ghost story. Write and illustrate a story titled "Brenda" that Katie might one day read to Sammy. • Katie has to answer three questions about a story her class reads. Apply the same questions to Kira-Kira and write the answers in three paragraphs. • What is the author trying to say in the scene where Mr. Takeshima confesses to Mr. Lyndon that he bashed his car? • What is the theme of the story? • How does the main character change at the end of the novel? • Katie notices that her parents work all the time and never take time to relax and have fun. Research the ritual of the Japanese tea ceremony (known as chanoyu or chado). Plan a tea ceremony that Katie might have for her parents. • Katie gives one of the eulogies at Lynn's funeral but sits down before she tells a special memory of Lynn. Write about a special memory of Lynn that Katie might have included in the eulogy. • Silly Kilgore's mother holds a pro-union meeting at her house at the end of the summer. Have the class plan this meeting. Instruct the speakers to point out the poor working conditions, long hours, safety issues, and low pay. Such meetings are only for the workers, but suggest that one student give a speech from Katie Takeshima's point of view. • Lynn always wanted to go to the ocean in California. Write a haiku titled "Kira-Kira" that Katie might write and dedicate to Lynn after her family returns from the west coast. • It is a Japanese custom to purchase souvenirs (or omiyage) from places they have traveled. Write a description of a souvenir that Katie might bring from California to put at Lynn's grave.